China has claimed that it is "very likely" that it overtook the US as the world's top trading nation, a title the US has held for decades. According to the latest data, China's total trade grew at an annual rate of 7.6% to $4.16tn (£2.5tn) last year. The US is yet to release it full-year figures, but its trade for the first 11 months of 2013 totalled $3.5tn. China became the world's biggest goods exporter in 2009. Its imports have also risen amid an expansion in its economy. "It is very likely that China has overtaken the US to become the world's largest trading country," said Zheng Yuesheng, a spokesman for China's customs administration. For some, it is perhaps surprising that China didn't already hold this position. The US is scheduled to release its full-year figures next month. 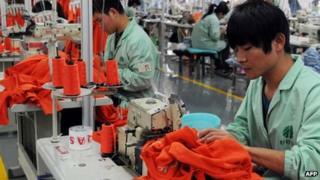 However, there have been concerns in recent months over the accuracy of China's export data. There has been speculation that some Chinese exporters may be overstating their shipments in an attempt to bypass restrictions on bringing funds into the country. For their part, Chinese policymakers have taken measures to counter the problem. In May last year, the State Administration of Foreign Exchange (SAFE), China foreign exchange regulator, said it would increase its scrutiny of export invoices and impose tougher penalties on firms providing false data. Sun Junwei, China economist at HSBC in Beijing, said the "recent measures could be working to squeeze out these fake trade activities". "We actually think these activities would be relatively contained this year compared with last year," she said. Some analysts also said that even if the issue of inflated numbers was taken into account, China would still take the top spot from the US. "The gap between the overall trade of China and the US is likely to be almost $250bn in 2013," Rajiv Biswas, chief economist Asia-pacific at IHS, told the BBC. "That is a significant difference and it is unlikely that any adjustment to the final figures will alter the position of the two countries." Mr Biswas added that the gap between the two countries was likely to become even wider in the current year. For the full year, China's exports rose at an annual rate of 7.9% in 2013, while imports grew 7.3%.